The Ogyen Choling Heritage House started operation in 2016. The Ogyen Choling manor built in 1898, is a historic, cultural site, with its origin going back to the 14th Century. The central tower of the manor was converted to become the first private museum in Bhutan . It was opened in 2001. 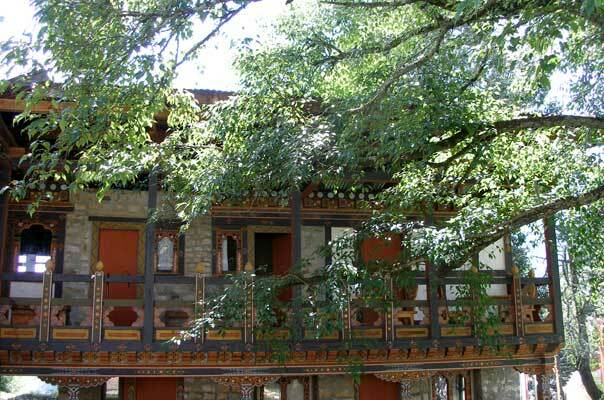 The Ogyen Choling Heritage House is an ideal place for guests interested in the history and culture of Bhutan, guests who appreciate the special setting with the calming spiritual ambiance and the solitude off the beaten track. Ogyen Choling is also the starting point for different day treks. The Ogyen Choling Heritage House has guest rooms in 3 buildings. The Nubgothang building in the west gate field which was previously used as a private guest house. It has 4 rooms. The shagor (two storied building enclosing the central tower) has 8 guest rooms. The dining room, the kitchen and a meeting room are also located in the shagor. Conscious efforts were made to retain the original ambiance of the rooms. Each room is different from the other. All rooms are cozy and simply furnished . Some rooms have individual heating facilities with wood burning stoves (bukhari), others have electric heaters. All the rooms have attached toilets and showers. Our sanitary installations are imported from Switzerland. We use solar energy to heat the water (except for the two rooms in the hermitage). Write to us at olinghh@gmail.com or wrjakar@gmx.ch for more information. Copyright (c) 2011-2017 oling.bt. All rights reserved.